The end of a development project is always bittersweet. On one hand it’s difficult to let go of something that has inspired such great energy and passion. On the other hand it’s immensely fulfilling to see the initial vision become a reality, and to stand witness as all of the hard work, long hours, and dedication culminate into a beautiful space that serves a greater purpose in the community. To say that applies to our Liv+ property is a massive understatement. As most people can attest, traditional student housing often lacks the creature comforts that have become more and more accessible in, and expected from, modern development projects. While many newly built apartment complexes and co-living spaces have challenged the concept of the standard dorm in which most of us called home back in college, they are oftentimes thinly veiled and lack substance. That’s why from the very beginning we set out to create an experience that not only delivers quality, state-of-the-art amenities, but far exceeds them. Over the last few years, the concept of Liv+ has taken shape in a way that has amazed even our most seasoned designers and developers. The idea of creating a whole new type of experience for students began to take on a life of its own as the project progressed from conception, to construction, to completion. Each stage offered new opportunities to assess the design, the spaces, the amenities, as well as the structure itself, giving us a chance to both reflect on the development process and anticipate fortuitous areas for improvement. As the saying goes, the results speak for themselves. From the modern yet classic exterior, to the beautiful landscaping, to the meticulously laid out interior lobby and spectacular pool, Liv+ Arlington is without a doubt the first of its kind, and in many ways, in a class of its own. With the grand opening this weekend, we hope to offer spaces and amenities that support a comfortable and collaborative community and that, in the same fashion as Liv+, will inspire the next generation of graduates to explore new possibilities and push the boundaries of the status quo. As the students begin to move in, there are definitely a lot of emotions surfacing from all sides, which is expected with a project of this magnitude and significance. It is bittersweet to see this development come to a close, but it is far more meaningful to see the expressions on the faces of the first wave of Liv+ students as they begin to settle in to their new home and new life. It’s safe to say that the property is in good hands, and that the next generation of student apartment living has officially arrived. 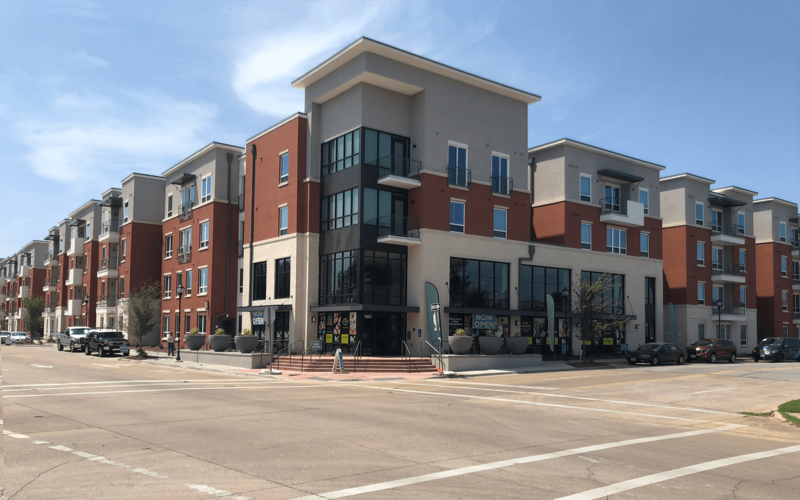 Liv+ student apartments are located just steps from the University of Texas at Arlington, and just minutes from restaurants and entertainment in the College Park District. The amenities include a fitness center and spin studio, outdoor courtyards with a pool, a hot tub, and fire pits, high-speed internet, in-unit washer and dryer, covered garage parking, and more.